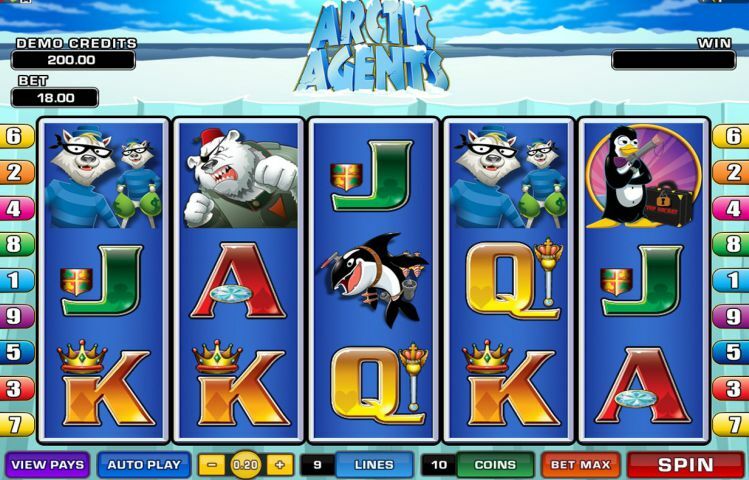 Arctic Agents is a delightful 5-reel, 9-payline online slot to play at Lucky Nugget. Follow Agent Penguin on his mission to recruit other agent in the icy weather while the big bad Polar Bear is trying to stop them. And there’s more: while you’re playing the Free Spins feature and the Iceberg Scatter lands anywhere on reels 1 and 5, you will be rewarded with a random prize of either 50x, 20x, 15x, 5x or 2x your total bet. The Double Up feature can be played after every winning spin during regular play. In this feature you can select either Black or Red to double your winnings. Alternatively you can select a suit (Hearts, Diamonds, Clubs or Spades) for a chance to quadruple your winnings. Other symbols that will reward you include the Killer Whale, Agent Penguin’s side-kick, the Polar Bear and Foxy Thieves. The Whale will try and attack from under the water as he rewards you with up to 1 500x your total bet. Arctic Agents can be played at Lucky Nugget Casino and while there are online casinos that want you to download the software, Lucky Nugget is the opposite. In fact, Arctic Agents cannot be found in the software and is only available in the Flash version of the casino. This is great news as you can play this great game directly in your browser, without going through the hassles of downloading. Plus, there are more than 250 games available in browser play, so you can choose from video slots, video poker, table games and even scratch cards. While there are far more games in the software version, you don’t always need so much choice, plus you will be missing out on some awesome games that’s exclusively available in the Flash version, like Ballistic Bingo, Crypt Crusade, Alaxe in Zombieland and Booty Time. Join Lucky Nugget Casino today and get a 150% match up to 200 credits as a welcome bonus. Alternatively you can take advantage of the high roller bonus, which is a 100% match up to 1000 credits.